Wudtools manufacturers Knives & Saws for Wood Working . For Veneer Industries and Match Industries. Length : 46", 42", 36", 32", 30", 28", 18", 14". Width : 4", 5", 6". Cladded Steel of various grades. With a Steel Portion of 70~72 mm Depending upon width of Peeling Knife. 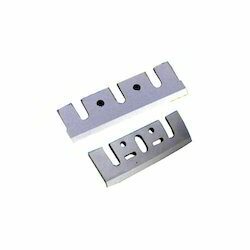 We also manufacture Veneer Clipper Knives as per customer's Specification and drawings. Standard Lengths : 6", 9", 10", 12", 14", 16", 18", 20", 24"
Standard Thickness : 1/8" (3 mm). AISI-M2 (H.S.S.) / Carbon Steel. Specially used in particle Board Mills, Chip Boards and Paper pulp Mills. Standard Machines : Pallamann, Clockner, Pessa, Windsor, Tata, KMW, Voith, Wigger, L & T & others. Generally made as per the machine and Model of the Machine. Various lengths, widths and thicknesses are possible. Rip Saws: For ripping hard and soft woods like Beech, Pine, Belu etc., in Gang Saws. Wudtools today is a market oriented manufacturer using the most modern manufacturing techniques to offer an interesting programme for producing precise cutting tools for Wood Working, Non-Ferrous, Ferrous and Plastics applications. It satisfies the demands of the Industries. Illustrated here are details of Tungsten Carbide Tipped Saws that are exported world over, made to DIN German stands and produced in our most modern Computer Numerically Controlled (CNC) plant. We produce standard saws as well as special saws for new material and for special burr free cuttings. We are your best source for any application. Note: 1. Special Sizes on request. For sizing and trimming soft, hard, Exotic Wood, Plywood and Raw Particle Board across the grain. Note: 1. Special Sizes on request. 2. Bore as required. 1. For Exotic Timbers, Solid or Veneered or cutting veneers in packs with grain. 2. For Trimming Exotic Timbers, Solid or veneered across the grain as well as Plastic Sheets and Plywood used in Furniture Manufacturing. A constant feeding speed of the material is recommended. Note: 1. Bore as required. For use on saw benches, radial arm saws and snipper saws. For sizing cuts in Aluminium Extrusion of up to 10 mm wall thickness as well as Plastic Extrusion. 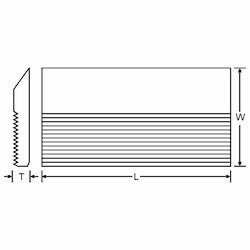 Also used for sizing sheet Aluminium or Plastic. For saw blades where there is a choice of number of teeth for the diameter the following rule applies. The saw with the highest number of teeth are suitable for materials upto 4 mm wall thickness. With thicker material less teeth are required. In all cases when cutting Aluminium or Rigid Plastic profiles the operator must ensure that the work piece is firmly clamped. Sizes above 600 Dia upto 1020 mm available on request as per specification. Note: 1. Special sizes on request, 2. Bore as required. With huge years of industry experience, we are offering Serrated Blade. The offered serrated backs are processed with the newest technology & our experts who use strong components. This range of serrated backs is known for their performance & durability which is particularly checked by quality inspectors for define their flawless range. Our customers can but these serrated backs from us at very reasonable rates. We are considered as one of the distinguished manufacturer, exporter, distributor, wholesaler, trader, & supplier of high quality Planer Saw Blade. These planners are developed in our superior developing unit by utilizing ultimate quality basic & cutting component and new innovative technology. Our quality experts perform a series of inspection on these planners in order to make them fault free. The offered planners are well known for its performance oriented design. Along with this, the offered planners are provided at best prices in the market. Used in veneer industries for slicing the wood logs. For Cremona Slicer, Czech Slicer, Tai Hai Slicer and Capital Slicer. Cladded Steel of various grades. 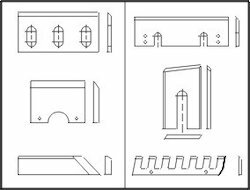 Wudtools manufactures Veneer Pressure Bars for all the types of knives noted below. 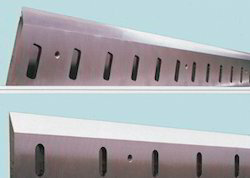 Veneer Pressure Bars made from High grade of steel, Hardened, Tempered, and ground finish. Standard Machines : Pallamann, Clockner, Pessa, Windsor, Tata, KMW, Voith, Wigger, L & T and others. Owing to our expertise in this domain, we are engaged in offering our clients Saw Blade. The offered band saws are processed with the newest technology & our experts who use strong components. This range of band saws is known for their performance & durability which is particularly checked by quality inspectors for define their flawless range. Our customers can but these band saws from us at very reasonable rates. We are recognized as the prominent manufacturer, exporter, distributor, wholesaler, trader, & supplier of a wide array of Saw Blade. The offered band saw tooth shapes are made by strong components along with the touch of excellence by our experts. Our quality specialist perfectly tests the band saw tooth shapes to deliver smooth range. Along with that, customers can take these band saw tooth shapes at affordable rates. Furthermore, we are giving this band saw tooth shapes perfect range at affordable prices. Owing to our expertise in this domain, we are engaged in offering our clients Peeling Blade. The offered peelings are specifically processed with top-notch components and newest ideas of developing keeping in mind ever the well defined requirements. Also, these peelings are known for their user friendliness & long life. Besides, we present these peelings customization options to choose from only at suitable rates. Looking for KNIVES & SAWS FOR WOOD WORKING ?